The new Mommy I’m Here Alert Child Locator with Distance alarm actually warns you when your child wanders approximately thirty-Feet away. Designed by parents, for parents, to give the best possible protection against child loss and abduction. Over eight hundred thousand times per year, a child is lost in the United States, leading to over fifty thousand real abductions. This is why you need the new, Mommy I’m Here Alert electronic Child Locator! It is easy to use and is like an invisible leash for kids. The new, Mommy I’m Here Alert Child Locator is so cute that your kids will want to wear it. Here’s how it works: When your child wanders out of an approximate 30 foot range, your convenient keychain remote transmitter will sound a loud alarm, Alerting you to the fact that your child has wandered. 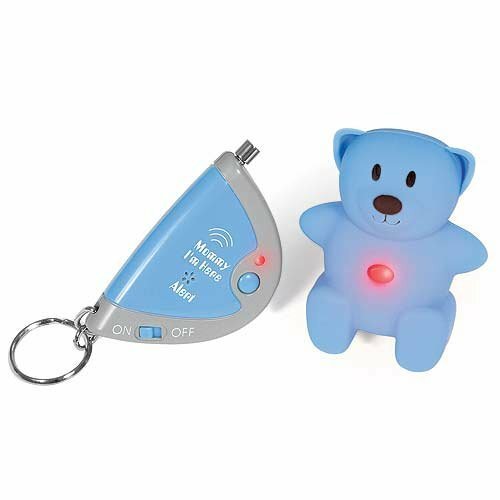 Then, simply press the button on your keychain remote transmitter to set off the alarm on the bear, Alerting others to the situation your child may be facing, stopping a potential abduction and allowing you to locate your child. The new Alert is a unique light blue color for both girls and boys, and features a soft, rubberized feel. The locator will work from over 150-Feet away, is easy to use, water resistant and comes with long-life batteries already installed and ready to use, right out of the packaging. The Mommy I’m Here cl-305BL electronic Child Locator comes with instructions, a sturdy mounting loop for lacing into the shoes(recommended), child’s belt, or suspenders. The world is growing more dangerous, give the new Mommy I’m Here Alert a try! Keep relaxed and aware of your child’s whereabouts with the Mommy I’m Here Alert, a small two-unit wireless device that alerts you when your child has gone out of a 25-foot range. 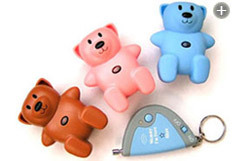 The cute, blue, teddy-bear-shaped unit mounts easily to a child’s shoe or belt. Ideal in public environments such as malls, the unit communicates with a keychain transmitter you keep on hand, quickly producing an audible alert when a child has wandered too far. Mommy I’m Here also offers locator units (with no automatic alert) in pink and brown.View Larger. The sturdy receiver is water-resistant and attaches securely to shoes, belts, and more. With a broad 150-foot range, the unit alerts you when a child wanders more than 25 feet. Great for a full day of activities, the receiver includes long-life batteries. If you often find yourself worried for your child’s security in public venues, or simply want to keep track of his or her location, the Mommy I’m Here Alert is your answer. This unique, fun-themed wireless child locator system is a great way to keep track of your child in any public location, such as a mall, airport, theme park, or sporting arena. 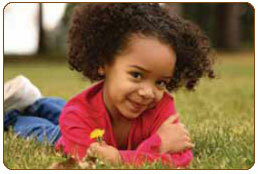 The locator is a two-unit system–one that attaches to your child and one you keep with you. When your child strays out of a 25-foot range, a chirp-like alert sounds from your unit, so you’re immediately aware that he or she has wandered from a secure distance. If you can’t locate your child right away, you can activate the 86-decibel alarm on your child’s unit, allowing you to find him or her quickly and easily. And the locator works from over 150-feet away, making it perfect for large venues and outdoor areas. The units establish their own proprietary frequency with each use, so inter-unit communication is strong and reliable. 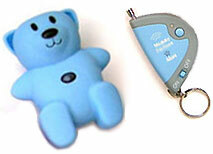 The playful teddy-bear-shaped receiver comes in a bright blue color. The receiver comes with a sturdy mounting loop, so it can be attached easily to a child’s shoelaces, Velcro straps, or belt, becoming a cute accessory for them and unbeatable reassurance for you. If you’ve ever dealt with physical locator solutions like leashes or harnesses, you will appreciate the wireless design of this locator. With the Mommy I’m Here Child Alert, you can keep your leashes on your pets and walk freely with your child without worry. Designed by parents for parents, the Mommy I’m Here offers several realistic assets any parent or guardian will appreciate. To begin with, it comes pre-installed with batteries, so you can start using it right away. Have a long day of activities planned? With this locator, it’s no problem–the long-life batteries deliver hours of operation. And because it’s engineered with active children in mind, the receiver is sturdy and water resistant. Q:Has anyone with a special needs/ASD child used this product? I am going to Disneyland and my son constantly wanders off and refuses to wear a leash. I used it with my child, she loved wearing it just as much as I’ve seen other children do too online. It apparently appears to them as something of a fun item to have and/or wear, so should be more enticing than a leash. When it goes off it really goes off, it’s LOUD, so as long as it’s triggered within reasonable range of the receiver, you’ll definitely hear it, hope it works out for you. Cheers!